This article is about the play. For other uses, see Mousetrap (disambiguation). A guest house, Monkswell Manor, wintertime "in the present day"
The Mousetrap is a murder mystery play by Agatha Christie. 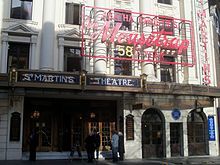 The Mousetrap opened in London's West End in 1952, and has been running continuously since then. The longest running West End show, it has by far the longest initial run of any play in history, with its 25,000th performance taking place on 18 November 2012. The play has a twist ending, which the audience are traditionally asked not to reveal after leaving the theatre. The play began life as a short radio play broadcast on 30 May 1947 called Three Blind Mice in honour of Queen Mary, the consort of King George V. It originated from the real-life case of Dennis O'Neill, who died after he and his brother Terence suffered extreme abuse while in the foster care of a Shropshire farmer and his wife in 1945. The play is based on a short story, itself based on the radio play, but Christie asked that the story not be published as long as it ran as a play in the West End of London. The short story has still not been published within the United Kingdom but it has appeared in the United States in the 1950 collection Three Blind Mice and Other Stories. When she wrote the play, Christie gave the rights to her grandson Mathew Prichard as a birthday present. In the United Kingdom, only one production of the play in addition to the West End production can be performed annually, and under the contract terms of the play, no film adaptation can be produced until the West End production has been closed for at least six months. The play had to be renamed at the insistence of Emile Littler who had produced a play called Three Blind Mice in the West End before the Second World War. The suggestion to call it The Mousetrap came from Christie's son-in-law, Anthony Hicks. In Shakespeare's play Hamlet, "The Mousetrap" is Hamlet's answer to Claudius's inquiry about the name of the play whose prologue and first scene the court has just observed (III, ii). 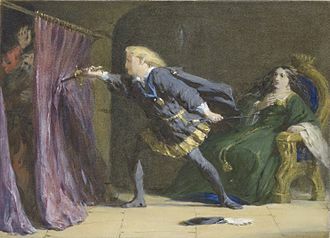 The play is actually The Murder of Gonzago, but Hamlet answers metaphorically, since "the play's the thing" in which he intends to "catch the conscience of the king." Three Blind Mice or its tune is heard a few times during the play. 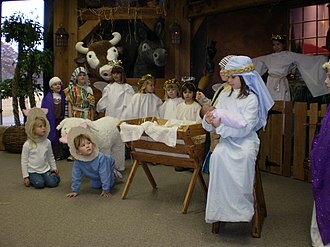 The play's longevity has ensured its popularity with tourists from around the world. In 1997, at the initiative of producer Stephen Waley-Cohen, the theatrical education charity Mousetrap Theatre Projects was launched, helping young people experience London's theatre. The play's storyline is set at "the present", which presumably means England as it was around the time when the play came out in 1952, including postwar continuation of WWII rationing. Tom Stoppard's 1968 play The Real Inspector Hound parodies many elements of The Mousetrap, including the surprise ending. As a stage play, The Mousetrap had its world premiere at the Theatre Royal, Nottingham on 6 October 1952. It was originally directed by Peter Cotes, elder brother of John and Roy Boulting, the film directors. Its pre-West End tour then took it to the New Theatre Oxford, the Manchester Opera House, the Royal Court Theatre, Liverpool, the Theatre Royal, Newcastle, the Grand Theatre Leeds and the Alexandra Theatre in Birmingham before it began its run in London on 25 November 1952 at the Ambassadors Theatre. It ran at this theatre until Saturday, 23 March 1974 when it immediately transferred to the larger St Martin's Theatre, next door, where it reopened on Monday, 25 March thus keeping its "initial run" status. The London run has now exceeded 26,000 performances. The director of the play for many years has been David Turner. Christie herself did not expect The Mousetrap to run for such a long time. In her autobiography, she reports a conversation that she had with Peter Saunders: "Fourteen months I am going to give it", says Saunders. To which Christie replies, "It won't run that long. Eight months perhaps. Yes, I think eight months." 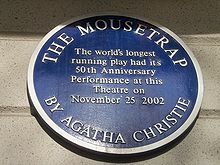 When it broke the record for the longest run of a play in the West End in September 1957, Christie received a mildly grudging telegram from fellow playwright Noël Coward: "Much as it pains me I really must congratulate you ..." In 2011 (by which time The Mousetrap had been running for almost 59 years) this long-lost document was found by a Cotswold furniture maker who was renovating a bureau purchased by a client from the Christie estate. Since the retirement of Mysie Monte and David Raven, who each made history by remaining in the cast for more than 11 years, in their roles as Mrs Boyle and Major Metcalf, the cast has been changed annually. 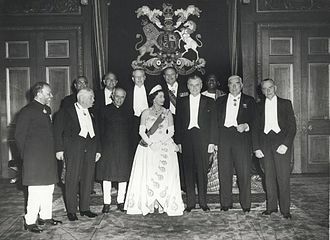 The change usually occurs around late November around the anniversary of the play's opening, and was the initiative of Sir Peter Saunders, the original producer. There is a tradition of the retiring leading lady and the new leading lady cutting a "Mousetrap cake" together. The play has also made theatrical history by having an original "cast member" survive all the cast changes since its opening night. The late Deryck Guyler can still be heard, via a recording, reading the radio news bulletin in the play to this present day. The set was changed in 1965 and 1999, but one prop survives from the original opening – the clock which sits on the mantelpiece of the fireplace in the main hall. In May 2001 (during the London production's 49th year, and to mark the 25th anniversary of Christie's death) the cast gave a semi-staged Sunday performance at the Palace Theatre, Westcliff-on-Sea as a guest contribution to the Agatha Christie Theatre Festival 2001, a twelve-week history-making cycle of all of Agatha Christie's plays presented by Roy Marsden's New Palace Theatre Company. A staging at the Toronto Truck Theatre in Toronto, Ontario, that opened on 19 August 1977 became Canada's longest running show, before finally closing on 18 January 2004 after a run of twenty-six years and over 9,000 performances. On 18 November 2012, both the 25,000th performance and the 60th year of the production were marked by a special charity performance which featured Hugh Bonneville, Patrick Stewart, Julie Walters and Miranda Hart. The money raised by the performance went towards Mousetrap Theatre Projects. During the Diamond Anniversary year of Mousetrap a touring production visited regional theatres for the first time in its history, whilst the London run continued uninterrupted. The play has also been presented internationally, in 2013 in Singapore, Kuala Lumpur and Bangkok, by the British Theatre Playhouse. Mollie Ralston – Proprietor of Monkswell Manor, and wife of Giles. Giles Ralston – Husband of Mollie who runs Monkswell Manor with his wife. Christopher Wren – The first guest to arrive at the hotel, Wren is a hyperactive young man who acts in a very peculiar manner. He admits he is running away from something, but refuses to say what. Wren claims to have been named after the architect of the same name by his parents. Mrs Boyle – A critical older woman who is pleased by nothing she observes. Major Metcalf – Retired from the army, little is known about Major Metcalf. Miss Casewell – A strange, aloof, masculine woman who speaks offhandedly about the horrific experiences of her childhood. Mr Paravicini – A man of unknown provenance, who turns up claiming his car has overturned in a snowdrift. He appears to be affecting a foreign accent and artificially aged with make-up. Detective Sergeant Trotter – The detective role during the play. He arrives in a snow storm and questions the proprietors and guests. The murderer's identity is divulged near the end of the play, in a twist ending which is unusual for playing with the very basis of the traditional whodunnit formula, where the cliché is that the detective solves the crime and exposes the remaining plot secrets. By tradition, at the end of each performance, audiences are asked not to reveal the identity of the killer to anyone outside the theatre, to ensure that the end of the play is not spoilt for future audiences. Christie was always upset by the plots of her works being revealed in reviews. 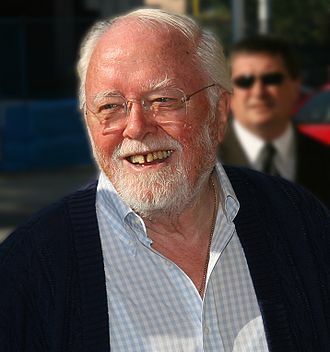 In 2010, her grandson Mathew Prichard, who receives the royalties from the play, was "dismayed" to learn from The Independent that the ending to The Mousetrap was revealed online in the play's Wikipedia article. Duncan Leatherdale of BBC News contrasted the play to other works like Psycho and The Sixth Sense, where the plot twist has been revealed and became itself an element of popular culture. 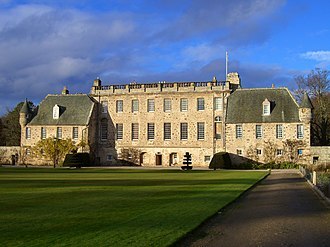 The play is set in the Great Hall of Monkswell Manor, in what Christie described as "the present". Act I opens with the murder of a woman named Maureen Lyon, played out in sound only. The action then moves to Monkswell Manor, recently converted to a guesthouse and run by a young couple, Mollie and Giles Ralston. 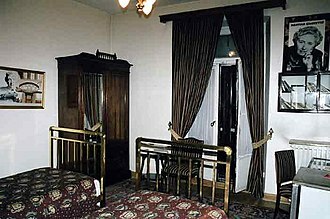 While waiting for the guests to arrive, Mollie listens to a radio report about the Lyon murder, which notes that police are looking for a man in a dark overcoat, observed near the scene. 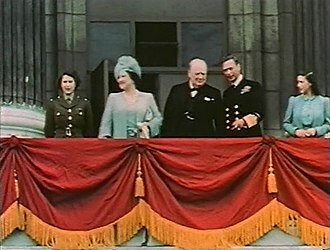 Their four guests arrive. Christopher Wren is an unkempt, flighty young man. Giles reacts strongly to Wren with instant dislike and Mollie with instinctual trust. Mrs Boyle and Major Metcalf then arrive together in a taxi from the station. Mrs Boyle complains about many things; Metcalf is an amiable ex-military man. Miss Casewell, a mannish young woman, is the last of the booked guests to arrive, before an unexpected fifth party appears. Identifying himself in a foreign accent as Mr Paravicini, he tells the Ralstons his car has overturned in a snowdrift. He remarks that the snow has blocked the roads and that the denizens of the house are trapped. Uneasy about Paravicini's manner, Mollie nevertheless places him in the last remaining room. The next afternoon the guest house proves to be snowed in, and the residents are restless. Mollie answers the telephone to Superintendent Hogben of the Berkshire Police. Hogben tells her that he is dispatching Sergeant Trotter to the guest house, and that the Ralstons must listen carefully to what Trotter has to tell them. The Ralstons wonder what they could have done to garner police attention. Trotter appears at the door on a pair of skis and Major Metcalf discovers that the phone has stopped working. Trotter explains he has been sent in regard to the murder of Maureen Lyon. In a story loosely based on the real Dennis O'Neill case the dead woman and her husband had mistreated their three foster children resulting in the death of the youngest. Both adults were imprisoned for their actions; the husband died in gaol, while the wife served her sentence and had been released, only to be found strangled. Police suspect the elder boy of the abused children, who would now be twenty-two, of being the killer. Trotter reveals that a notebook found at the murder scene contained the address of Monkswell Manor and the words "Three Blind Mice". A note reading "This is the First" was pinned to the woman's body. The police have sent Trotter to find out how the Ralstons' guesthouse is connected to the murder, and whether the residents are in danger. 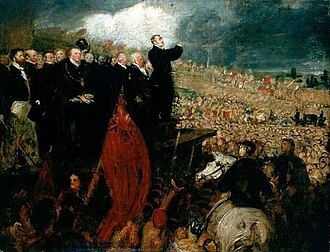 Both Giles and Mollie deny a connection to the case, though Mollie is ill at ease answering Trotter's questions and quickly excuses herself. Trotter asks each of the guests to explain why they are at Monkswell Manor and any connection they have to the foster children. All five guests deny any personal knowledge of the case. While Trotter and Giles tour the house, Major Metcalf confronts Mrs Boyle, revealing that she was one of the magistrates who had assigned the children to the foster parents. Mrs Boyle acknowledges this but denies that she has any responsibility for what eventually happened to the children there. As the evening wears on, Giles and Mollie become suspicious of each other while the guests snipe at one another. Sergeant Trotter traces the phone wire to find out if it has been cut. Mrs Boyle wanders back into the now-empty room and listens to the radio. The opening notes of "Three Blind Mice" are heard whistled by an unknown party, and Mrs Boyle responds without alarm, speaking to the person only she can see. Suddenly, the lights go out and a scuffle is heard. Moments later, Mollie walks into the room and turns on the lights, only to find Mrs Boyle dead on the floor. Ten minutes after Mollie found Mrs Boyle dead of strangulation, Sergeant Trotter has taken charge of the household. All the remaining residents are gathered in one room as he attempts to sort out the events of the evening. A shaken Mollie Ralston cannot provide him with any useful clues; the only thing she is sure she observed was the radio blaring. Frustrated, Trotter points out that their lives continue to be in danger; a third murder could very well happen, given the notes left with Maureen Lyon. He insists that everyone tell him where they were when Mrs Boyle was murdered. As each person recounts his or her whereabouts, Trotter takes them to account for inconsistencies or weaknesses in their stories. Finally, he declares that everyone in the house had the opportunity to commit the murder, since each of them was alone at the time. 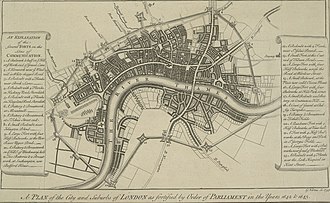 Giles counters that while seven people in the house lack alibis, only one fits the description of the man the police suspect to be the murderer: Christopher Wren. Wren insists that it is all a frame-up, and Trotter acknowledges that he lacks any evidence pointing to Wren in particular. Mollie later pulls Trotter aside; Trotter says that while the police suspect the elder boy to be the killer, the dead boy also had relatives and loved ones who might be interested in revenge: the children's father, an Army sergeant, for example; or the dead boy's sister, who would now be a young woman. Trotter notes that Metcalf or Paravicini could be the father, Miss Casewell or Mollie could be the sister, and Giles could be the elder boy. Mollie, aghast, objects to the notion that either she or Giles could be a murderer, but Trotter forces her to admit that they know little about each other's pasts. 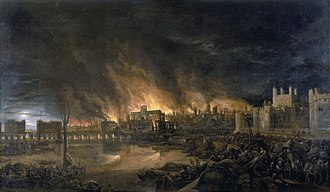 Mollie soon finds herself in conversation with Christopher Wren, who confesses that he is actually an Army deserter hiding from his past under a false name. Mollie acknowledges that she, too, is running away from her past. Despite the trust Christopher and Mollie are forming, he and Giles each suspect the other and nearly come to blows over Mollie. The situation is only defused by the arrival of Paravicini, who tells the company that Trotter's skis are missing. Trotter again calls an assembly of the household, declaring that he now intends to check the alibis everyone provided to him after Mrs Boyle's murder. They will re-enact the murder, with each member of the household acting out another's alibi. Trotter's hope is that while most of the alibis will be verified, one will be proved impossible. Each person is to go to his or her assigned position and stay there until summoned back by Trotter. The household obediently disperses, leaving Trotter alone onstage. 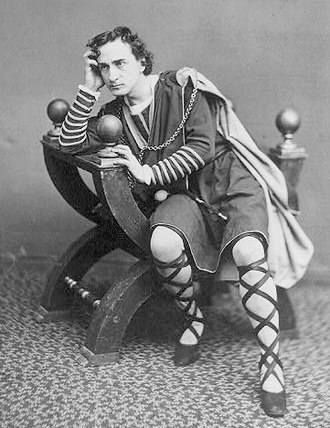 After the role-players scatter, Trotter sits for a moment before calling for Mollie. He tells her that she has risked extreme danger by not identifying herself to him; he now knows that she was once the schoolteacher of the doomed Corrigan children. She failed to answer a letter the younger boy sent her at the time, begging to be rescued from the farm. Mollie protests that she had been seriously ill when the letter arrived, and was unable to even read it until well after the boy was dead. To this day, she says, she is haunted by her failure to help the children out of their circumstances. Trotter takes a gun out of his pocket and points it at Mollie, telling her that though she assumed he was a policeman, she only believed that because he had rung up beforehand, playing the role of his own superintendent. Trotter is, in fact, Georgie, the elder Corrigan brother, and he intends to take his revenge on Mollie. Falling back into the demeanour of a wounded child who never grew up, he drops his gun and begins to strangle her, but is stopped by the sudden appearance of Miss Casewell. Casewell calls him by name and reveals that she is Kathy, his long-lost sister, come to take him somewhere safe. Major Metcalf, who accompanied Miss Casewell into the room, summons Giles and tells the frightened innkeepers that he had known all along that Trotter wasn't a policeman – because Metcalf himself is a policeman, having arranged to switch places with the real Major Metcalf after discovering the "Three Blind Mice" notebook on Maureen Lyon. The play made little stir in the review pages of the British press when it opened. The Manchester Guardian commented that it was "a middling piece" with "less in it than meets the eye ... Coincidence is stretched unreasonably." The critic commented that the characters were "built entirely of clichés". The reviewer in The Times was more favourably disposed to the characters, calling them "nicely assorted, individually labelled and readily identified", and found the plot "elaborately skilful." In The Daily Express John Barber praised "the atmosphere of shuddering suspense" but thought some of the characters "too obvious by half". In The Illustrated London News, J. C. Trewin commented that those who failed to spot the killer would probably call the plot "preposterous and over-burdened", but those who succeeded might be more kindly disposed. The play was published as a paperback by Samuel French Ltd as French's Acting Edition No. 153 in 1954 and is still in print. It was first published in hardback in The Mousetrap and Other Plays by G. P. Putnam's Sons in 1978 (ISBN 0-396-07631-9). In 1959 it was announced that Edward Small, who had produced Witness for the Prosecution for the screen, was to make a film version of the play in co-production with Victor Saville for United Artists. Tyrone Power and Maria Schell were named as leads. However, no film version resulted. In 1960, the Bengali author Premendra Mitra directed a film Chupi Chupi Aashey, based on the radio play and short story. This uncredited adaptation is possibly the only notable film version of The Mousetrap. In 1990, Russian director Samson Samsonov made a movie entitled "Мышеловка" ("Myshelovka", "The Mousetrap") at Mosfilm. The script by Vladimir Basov is based on Agatha Christie's play. ^ a b c Marsden, Sam (18 Nov 2012). "Agatha Christie's The Mousetrap celebrates its 60th anniversary with star-studded show". The Daily Telegraph. London. Retrieved November 19, 2012. ^ Morgan, Janet. Agatha Christie, A Biography. (Page 291) Collins, 1984 ISBN 0-00-216330-6. ^ "Mousetrap Theatre Projects – History", Mousetrap Theatre Projects, March 15, 2012. Retrieved 2012-12-01. ^ M. Carlson (1993). "Is there a real inspector Hound? Mousetraps, deathtraps, and the disappearing detective". Modern drama. Hakkert. 36 (3): 431–442. doi:10.3138/md.36.3.431. ISSN 0026-7694. INIST 24084, 35400002380674.0070. ^ "Mousetrap website". The-mousetrap.co.uk. Retrieved 18 June 2017. ^ Bruce Pendergast (2004). Everyman's Guide to the Mysteries of Agatha Christie. Trafford Publishing. pp. 32, 299. ISBN 978-1-4120-2304-7. ^ Antiques Trade Gazette, Issue 2003, 20 August 2001, page 14. Found with the telegram was a lingerie bill from 1952 for £24.13s. 6d. ^ "PR Newswire report of event". Prnewswire.co.uk. January 2001. Retrieved 7 June 2009. ^ Masters, Tim (25 Nov 2011). "The Mousetrap to tour for 60th anniversary". BBC News. London. Retrieved December 13, 2013. ^ "Past Productions". British Theatre Playhouse. 2017. Retrieved 3 December 2017. ^ The Seven Basic Plots: Why We Tell Stories. Christopher Booker. The Seven Basic Plots: Why We Tell Stories. Continuum. p. 15. ^ Leach, Ben (29 Aug 2010). "Agatha Christie's family criticise Wikipedia for revealing Mousetrap ending". Daily Telegraph. Retrieved 20 October 2010. ^ Bignell, Paul; Matthew Bell (17 September 2010). "Wikipedia springs 'Mousetrap' ending". The Independent. Retrieved 4 November 2010. ^ Cohen, Noam (17 September 2010). "Spoiler Alert: Whodunit? Wikipedia Will Tell You". The New York Times. Retrieved 29 June 2012. ^ "Lifting the lid on spoilers". BBC News. Retrieved 2016-08-19. ^ ' BEN-HUR' TO RACE FOR 213 MINUTES: Film Will Be Third Longest Shown – Small and Saville Planning 'Dear Spy' By RICHARD NASON. New York Times (1923–Current file) [New York, N.Y] 07 Oct 1959: 47. ^ Debbie Gets Chance For Real Dramatics Hopper, Hedda. The Washington Post and Times Herald (1954–1959) [Washington, D.C] 01 Nov 1958: D13. ^ Saunders, Tristram Fane (18 May 2016). "10 things you didn't know about The Mousetrap" – via www.telegraph.co.uk. B. Vogelsinger (2005). "New Voices: Blind Mice and a Motive – Studying Agatha Christie's The Mousetrap". English Journal. 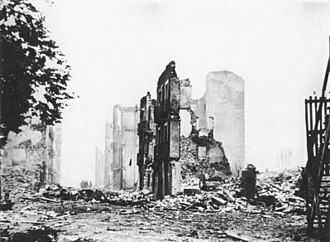 95 (1): 113–5. doi:10.2307/30047411. JSTOR 30047411. Martha Morrow (1976). "Page and stage: a structural investigation of Agatha Christie's Three Blind Mice and The Mousetrap". Eastern Illinois University. Wikimedia Commons has media related to The Mousetrap (play). Sir Tom Stoppard OM CBE FRSL is a Czech-born British playwright and screenwriter, knighted in 1997. He co-wrote the screenplays for Brazil, The Russia House, and Shakespeare in Love, themes of human rights and political freedom pervade his work along with exploration of linguistics and philosophy. Stoppard has been a key playwright of the National Theatre and is one of the most internationally performed dramatists of his generation, in 2008 The Daily Telegraph ranked him number 11 in their list of the 100 most powerful people in British culture. Born in Czechoslovakia, Stoppard left as a refugee, fleeing imminent Nazi occupation. He settled with his family in Britain after the war, in 1946, after being educated at schools in Nottingham and Yorkshire, Stoppard became a journalist, a drama critic and then, in 1960, a playwright. He has been married three times, to Josie Ingle, Miriam Stoppard, and Sabrina Guinness, Stoppard was born Tomáš Straussler, in Zlín, a shoe town, in the Moravia region of Czechoslovakia. He was the son of Martha Becková and Eugen Straussler, a doctor with the Bata shoe company, both of his parents were non-observant Jews, part of a long-established community. Just before the German occupation of Czechoslovakia, the patron, Jan Antonín Baťa, helped re-post his Jewish employees, mostly physicians. 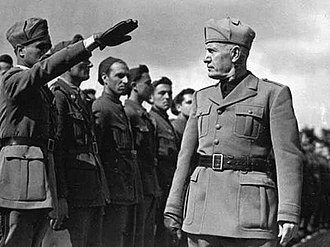 On 15 March 1939, the day that the Nazis invaded Czechoslovakia, before the Japanese occupation of Singapore, the two sons and their mother were sent on to Australia. 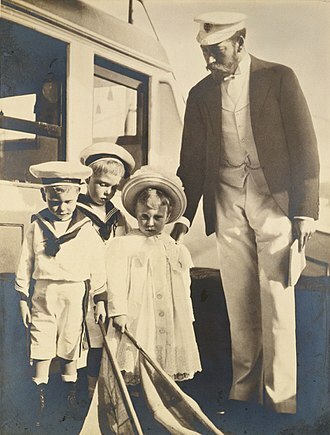 Stoppards father remained in Singapore as a British army volunteer, knowing that, as a doctor and his father died when Stoppard was four years old. From there, in 1941, when Tomas was five, the three were evacuated to Darjeeling in India, the boys attended Mount Hermon School, an American multi-racial school, where Tomas became Tom and his brother Petr became Peter. In 1945, his mother Martha married British army major Kenneth Stoppard, setting up Stoppards desire as a child to become an honorary Englishman. I fairly often find Im with people who forget I dont quite belong in the world were in, he says. 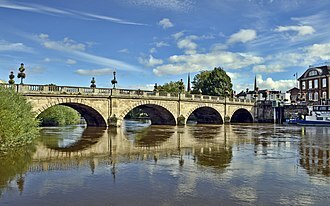 Shropshire Council was created in 2009, a unitary authority taking over from the previous county council and five district councils. The borough of Telford and Wrekin has been a unitary authority since 1998. The county has many towns, including Whitchurch in the north, Newport north-east of Telford. The Ironbridge Gorge area is a UNESCO World Heritage Site, covering Ironbridge, there are other historic industrial sites in the county, such as at Shrewsbury, Broseley and Highley, as well as the Shropshire Union Canal. The Shropshire Hills Area of Outstanding Natural Beauty covers about a quarter of the county, Shropshire is one of Englands most rural and sparsely populated counties, with a population density of 136/km2. The Wrekin is one of the most famous landmarks in the county, though the highest hills are the Clee Hills, Stiperstones. Wenlock Edge is another significant geographical and geological landmark, the River Severn, Great Britains longest river, runs through the county, exiting into Worcestershire via the Severn Valley. Shropshire is landlocked and with an area of 3,487 square kilometres is Englands largest inland county, the county flower is the round-leaved sundew. The area was part of the lands of the Cornovii. This was a tribal Celtic iron age kingdom and their capital in pre-Roman times was probably a hill fort on the Wrekin. Ptolemys 2nd century Geography names one of their towns as being Viroconium Cornoviorum, after the Roman occupation of Britain ended in the 5th century, the Shropshire area was in the eastern part of the Welsh Kingdom of Powys, known in Welsh poetry as the Paradise of Powys. It was annexed to the Angle kingdom of Mercia by King Offa in the 8th century, in subsequent centuries, the area suffered repeated Danish invasion, and fortresses were built at Bridgnorth and Chirbury. Many defensive castles were built at this time across the county to defend against the Welsh and enable effective control of the region, including Ludlow Castle, the western frontier with Wales was not finally determined until the 14th century. For the film adaptations, see Chu-Chin-Chow and Chu Chin Chow. Chu Chin Chow is a comedy written and directed by Oscar Asche, with music by Frederic Norton, based on the story of Ali Baba. The shows first American production in New York, with lyrics by Arthur Anderson, played for 208 performances in 1917–1918. 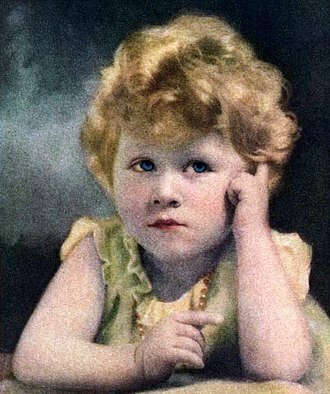 It subsequently had successful seasons elsewhere in America and Australia, including in 1919,1920,1921 and 1922, a silent film of the musical, starring Betty Blythe, was produced in 1925 using some of the music. The show toured the British provinces for many years and it returned to London in 1940 for 80 performances, when it was interrupted by the London bombing but returned in 1941 for another 158 nights. In 1953, an ice version was produced at London’s Empire Pool, starring Tyrone Power, occasional productions are still mounted, including one in July 2008 by the Finborough Theatre in London, England. The success of the Arabian Nights adaptation Kismet, a 1911 play by Edward Knoblock, inspired Oscar Asche to write, Asche directed the musical and played the lead role of Abu Hasan, leader of the forty thieves. Besides Asche, the production starred his wife, Lily Brayton, costumes were by the designer Percy Anderson. Chu Chin Chow was described as a combination of musical comedy and it was a big budget spectacular costing £5,300, with over a dozen scene changes, fantastic sets, big dance routines, exotic costumes and Asches well-known innovative lighting designs. The design for the show was influenced by the English taste for all connected with Asia which had originated with Diaghilev’s production of the ballet Scheherazade. Theatre journal The Era said that Nortons music had a touch of the East but for the most part it was on a level with the melody of musical comedy. Nevertheless, many of the songs became hits, and The Cobblers Song, tickets to see Chu Chin Chow were particularly eagerly sought by troops on leave from the Western Front. One of the attractions for the soldiers was the chorus of pretty slave girls who. 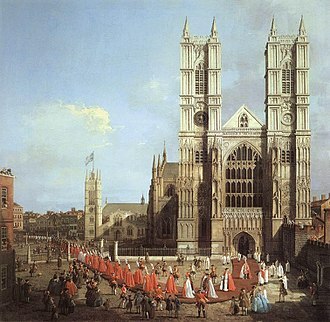 Complaints, not by the soldiers, resulted in the Lord Chamberlain viewing the show, the cast was large and included a camel, a donkey and snakes. The Theatre Royal attracts major touring dramas, ballet, West End musicals and an annual pantomime. The Theatre Royal was completed in 1865, after six months of work and costing the clients, lace manufacturers John, the Classic façade and Corinthian columns designed by Charles J. Phipps are still a major Nottingham landmark. The Theatre Royal opened on Monday,25 September 1865 with Sheridan’s The School for Scandal, baroness Orczy’s The Scarlet Pimpernel was first produced at the Theatre Royal by Fred Terry and Julia Neilson before being published as a novel. Although initially the play was met with success, the novel is credited with influencing the mystery genre. On October 6,1952, the theatre made history with the premiere of The Mousetrap. 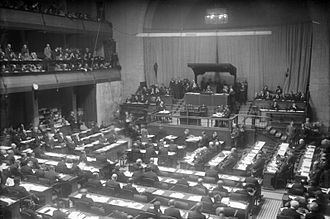 The play has gone on to be the theatrical production in the world. In 1969 the city bought the theatre and began restoring it at a cost of £4 million in the day. It was in need of restoration and had earned a reputation as one of the worst theatres for backstage conditions in the country and it was officially reopened 6 June 1978 by Princess Anne who was “impressed and delighted” and said “…what an improvement on the old place. All you had there was the smell of gas. ”Inside she met with “…City Council leader Coun, Jack Green…” and unveiled a plaque in the foyer. The elegant portico, with its six Corinthian columns of Ancaster stone, the orientation of the portico was designed to afford maximum effect, closing a new street from the Great Market Place, Market Street. The Theatre Royal was closed between the end of April and September 1897 for remodelling, the works included building new dressing rooms at the rear to clear part of the site for the Empire. Matcham refashioned the existing auditorium, Frank Matcham pioneered the use of cantilevered steel in his designs, and patented his design. This allowed balconies to be built without the use of supporting pillars, without pillars, lowering the stage and increasing the rake of the tiers, sight lines were much improved and the audience capacity increased to around 3,000. The theatre has four tiers of seating, the stalls, dress circle, upper circle and it has seven fully licensed bars including The Green Room Cafe Bar on the ground floor and The Restaurant on the dress circle level. The Tragedy of Hamlet, Prince of Denmark, often shortened to Hamlet, is a tragedy written by William Shakespeare at an uncertain date between 1599 and 1602. Set in the Kingdom of Denmark, the play dramatises the revenge Prince Hamlet is called to wreak upon his uncle, Claudius, by the ghost of Hamlets father, Claudius had murdered his own brother and seized the throne, marrying his deceased brothers widow. It has inspired many other writers—from Johann Wolfgang von Goethe and Charles Dickens to James Joyce and he almost certainly wrote his version of the title role for his fellow actor, Richard Burbage, the leading tragedian of Shakespeares time. In the 400 years since its inception, the role has been performed by highly acclaimed actors in each successive century. Three different early versions of the play are extant, the First Quarto, the Second Quarto, each version includes lines and entire scenes missing from the others. The plays structure and depth of characterisation have inspired much critical scrutiny, the protagonist of Hamlet is Prince Hamlet of Denmark, son of the recently deceased King Hamlet, and nephew of King Claudius, his fathers brother and successor. Claudius hastily married King Hamlets widow, Hamlets mother, Denmark has a long-standing feud with neighboring Norway, which culminated when King Hamlet slew King Fortinbras of Norway in a battle years ago. Although Denmark defeated Norway, and the Norwegian throne fell to King Fortinbrass infirm brother, Denmark fears that an invasion led by the dead Norwegian kings son, Prince Fortinbras, is imminent. On a cold night on the ramparts of Elsinore, the Danish royal castle and they vow to tell Prince Hamlet what they have witnessed. As the court gathers the next day, while King Claudius and Queen Gertrude discuss affairs of state with their elderly adviser Polonius, after the court exits, Hamlet despairs of his fathers death and his mothers hasty remarriage. Learning of the ghost from Horatio, Hamlet resolves to see it himself, as Poloniuss son Laertes prepares to depart for a visit to France, Polonius gives him contradictory advice that culminates in the ironic maxim to thine own self be true. Poloniuss daughter, admits her interest in Hamlet, and that night on the rampart, the ghost appears to Hamlet, telling the prince that he was murdered by Claudius and demanding that Hamlet avenge him. Hamlet agrees and the ghost vanishes, the prince confides to Horatio and the sentries that from now on he plans to put an antic disposition on and forces them to swear to keep his plans for revenge secret. Privately, however, he remains uncertain of the ghosts reliability, soon thereafter, Ophelia rushes to her father, telling him that Hamlet arrived at her door the prior night half-undressed and behaving crazily. Polonius blames love for Hamlets madness and resolves to inform Claudius, as he enters to do so, the king and queen finish welcoming Rosencrantz and Guildenstern, two student acquaintances of Hamlet, to Elsinore. The royal couple has requested that the students investigate the cause of Hamlets mood, additional news requires that Polonius wait to be heard, messengers from Norway inform Claudius that the King of Norway has rebuked Prince Fortinbras for attempting to re-fight his fathers battles. A First World War government leaflet detailing the consequences of breaking the rationing laws. Child's ration book, used during the Second World War. 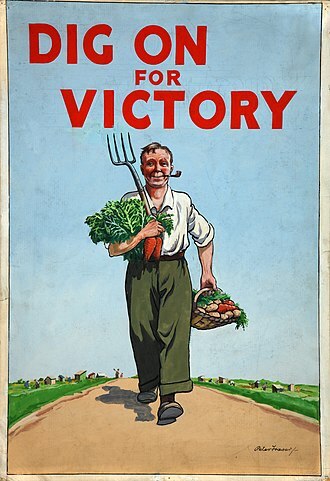 Poster for the "Dig for Victory" campaign, encouraging Britons to supplement their rations by cultivating gardens and allotments. View of the stage from the Balcony. Sherlock Holmes, right, hero of crime fiction, confers with his colleague Dr. Watson; together these characters popularized the genre.